Position: Leader of the Celflux team. Realm: Uomi is a race of desert nomads. They move from place to place trading in various crafts and goods. They are very superstitious and have a strict social order that they enforce with violence if necessary. Profile: Daughter of a seer. Member of the outcasts. A group ostracised by the general population. Height: 5 Ft 8” Eyes: Light Brown Hair: Black. Personality: Introverted but hot tempered. 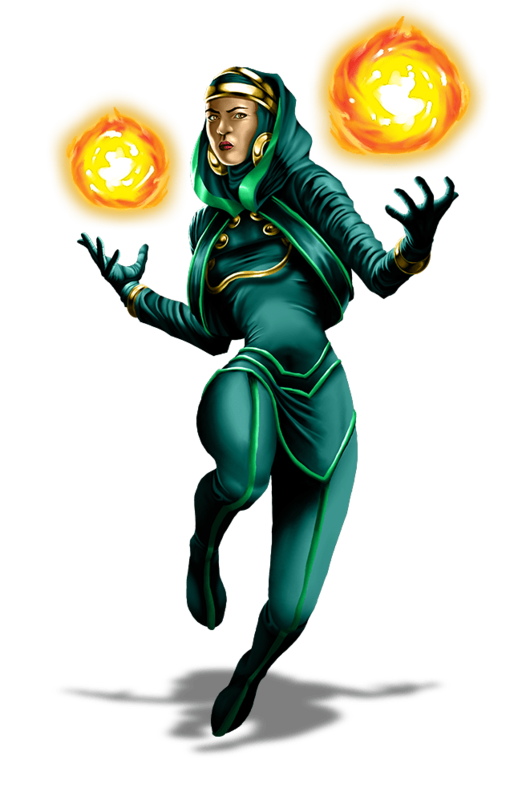 Abilities: Shandrita has the ability to generate and control fire. Ever since she was a young girl, Shandrita's mother Idha was a seer. She could see things, spiritual things, others could not. She kept it a secret most of her life because the people of Uomi are very religious and somewhat superstitious. When Shandrita was born she had an overpowering vision of doom. The vision put her in a trance and she began to prophesy. She was ostracized by her community and abandoned by her husband. She was considered an untouchable and had a very difficult time living on her own. Shandrita grew up being bullied by other children who called her the daughter of a witch. As a result, she became very introverted and developed a very bad temper. She grew up without friends and dealing with her panic-stricken mother who was always looking for the doomsday prophecy to be fulfilled. It was hard work living outside of society. She resents her mother and longs for a day when she can live a normal life. She also distrusts people because she knows first hand how mean they can be.